Disponibilité: En stock, dépêchez-vous! Seulement 17 reste! 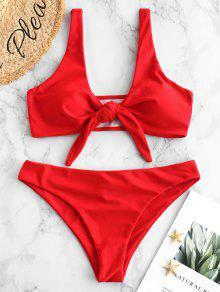 Il est temps d'apporter ce maillot de bain pour un voyage simple! Vous pouvez adorer cet ensemble de bikini puisqu'il combine à la fois simple et chic. Le soutien-gorge plongeant a un joli noeud sur le devant et des coussinets confortables pour le soulèvement. I love love LOVE this suit!! It fits me perfectly and is so flattering to my figure. I'm a small but have 32D breasts, so I took the cups out of the top to feel more comfortable because with them, I felt sort of smushed. But with those out, this is easily one of my favorite bathing suits I own. Looks exaclty like the pictures, I ordered a small! 5’8 150 pounds. Wear a size 6-8 in pants. Recently lost a lot of weight so I ordered various sizes in suits. I love the way this one feels. Best one I’ve ordered. Bottoms are stretchy. Pretty color.